The wage index in November 2018 is 670.6 points, 0.1% higher than in the previous month. In the last twelve months the monthly wage index has risen by 6.2%. The real wage index in November 2018 is 149.4 points, 0.1% lower than in the previous month. In the last twelve months the real wage index has risen by 2.8%. The wage index is a price index based on data from the Icelandic survey on wages earnings and labour cost. The purpose of the index is to reflect changes in wages paid for fixed working hours. The index is based on earnings for contractual working hours and includes all wages paid for day time and fixed overtime hours, including additional payments and bonuses. Irregular payments and employers' social contributions and taxes are excluded. 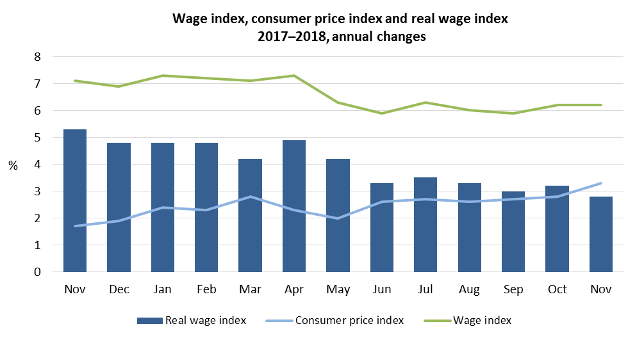 The real wage index shows changes in wages in relation to changes of the consumer price index. In general, real wages increase when wages increase more than price levels, but decrease when inflation is higher than wage rises. Real wages are not the same as disposable income of households.